Congratulations, you’ve landed an interview for that great job you’ve always wanted! Now what? It’s up to you to thoroughly prepare yourself for the interview, and that includes brushing up on your knowledge and application of body language. The right body language will not get you the job if you’re not qualified for it, but the wrong body language can make it much harder to get the job even if you are the most qualified for it. Before you go to the interview take some time to check out your body language in a mirror or, ideally, on video tape. Recruit a trusted friend or loved one to help you with this process, role playing as the mock interviewer. Dress in your interview clothes and observe yourself as you walk into the room. Do you walk confidently with your head up and shoulders back? Is your facial expression pleasant? What about your eye contact, is it direct without turning into a staring challenge? 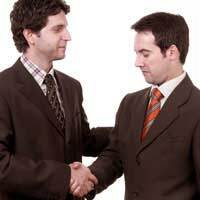 Is your hand shake firm but not overpowering? Practice taking a seat and fielding questions from the interviewer. Do you sit comfortably in the chair with your shoulders upright and your upper body relaxed? Are your hands resting comfortably on the arms of the chair or in your lap? Is your facial expression pleasant and your eye contact steady? Place a notepad in front of you that contains questions you want to ask the interviewer when the time comes, and then practice asking those questions smoothly and without staring at the notepad to read them. Interviewers look carefully at job candidates from the moment they arrive at the interview location, so put your best self forward when you walk in the door. Hold your body in a confident position, use good eye contact, and don’t shift your body back and forth nervously. If you must sit and wait in a lobby area, be sure to sit calmly and with a relaxed body position, not tapping your fingers or bouncing your knee nervously. When the time comes to walk into the interview room, you’ll be glad you practiced ahead of time. Relax, show your confidence, but don’t allow yourself to become too informal. The interviewer will probably indicate where you should sit, but if not be sure to ask instead of just selecting a seat on your own. As the interview progresses, use your body language to add emphasis to important answers. Lean forward a bit toward the interviewer to show your sincerity and be sure to maintain good eye contact. Don’t be afraid to pause for a moment or two to compose your thoughts before answering a question, but don’t allow your eyes to dart around the room or your facial expression to become confused. Use your knowledge of body language to read the interviewer’s body language as well. This will help you through the process and indicate if/when you need to make adjustments along the way. For instance, if the interviewer starts out attentive but fades to boredom or a glassy-eyed stare, you may be giving answers that are too lengthy or too rambling. Watch for indications of interest from the interviewer, such as leaning forward to ask a particular question or to better listen to your answer. These are often indicators of a question or topic that’s important to the job, so give the very best answer possible. Sometimes no matter what you do, the interviewer will ‘check out’ of the process part way through. Maybe you don’t appear to have the right qualifications for the job, or perhaps the interviewer doesn’t think you’re a good fit for the position. Regardless of the reason, if you sense the interviewer losing interest don’t give up. Maintain your confident body position and eye contact throughout, even when it comes time to leave the room. Remember, even if you don’t get the job the interview process is worth your time and effort because it allows you to practice and polish your interview skills. Think about how and what your body language communicates throughout the interview, and use that information to improve and strengthen your use of non-verbal communication in the future.